Look at this picture! It is the picture of bliss isn't it? That's me in the bed. A mother again...for the third time, at 40 years old. In my arms is Ila Marice Fisher, our new addition. Next to me, looking lovingly at her are my two sons from a previous marriage. The one with the short hair is Aidan, my 16 year old, and the one with the hair in his eyes is my 13 year old, Gannan. Their step-father standing behind them, father of Ila, is Jeffrey, my husband of 10 years. It is a PICTURE of bliss, but I'll let you in on a little secret, only one person was truly blissful. The others? Well let's start with Gannan. What he was really thinking is "When can I get a snack?" He had asked for money to get food from the vending machine the moment he walked in and when he didn't get it right away, he said to the nurse, "They better give me that money for the machine. It was the only reason I came!" After hearing about the vending machine for the umpteenth time, I finally said, "If you smile for one picture, I will give you the money." I swear I saw the nurse do a head slap behind me...But I couldn't say for sure. Then there's Aidan. Look closely at him again. Behind that smile is a tortured soul. You see, Aidan had moved out of our house to live with his dad a few months before the birth of his sister. He couldn't stand our rules. Wanted to find greener pastures. But the pasture wasn't so green, and behind those twinkling eyes he was wrestling with whom he wanted to live. Must have felt awful to not know where you belong. Take a look at Jeffrey again, and you will be looking upon the truly happy one in the bunch of us. During his first marriage he was told that he'd never have children. Apparently his little swimmers didn't swim. But somehow the Micheal Phelps of sperm showed up one fateful night because there was Ila in my arms, a living and breathing part of Jeffrey. For him, it was a gold medal occasion. And then of course there is me. Behind my smile is a bittersweet taste made up ingredients that don't usually mix well together; the taste of angst and duty and happiness and resentment. My feelings at this moment were muddled, as they have been throughout the 16 years of motherhood that came before this photo. As they are, I bet, for many moms who paste on daily smiles as if posing for a picture. My mind was a reel that sounded something like this, "Was I up for the job? How could I NOT give Jeffrey the child he has always wanted? After all she IS so beautiful. But, when will it be MY turn to do what I have always put aside for the sake of the children? I don't want to wait another 18 years." In the blogs to come, you'll read about the bitter moments of motherhood and, well, the sweet ones too. I hope that you find yourself in some of my stories. I hope you find comfort in the fact that out in the cosmos there are mothers who feel and think as you do. Welcome again all you Muddled Mothers. You belong here! I LOVE to read your writing Logan. :) You are such a great writer. I can't wait to read your next blog! omg...you can spell out what I've only been thinking... your awesome Logan. You are my favorite author! Thank you so much for inspiring me to become a better writer! Love reading your writing. And of course this blog is a perfect reminder as to why I don't want children. I'm sure Paul will thank you as well! Hee Hee! Loved it!! Can't wait till the next one! Logan, enjoying the debut of your blog... Looking forward to the next round! Like our names, our hearts rhyme with the dichotomies of life. im a late comer to your muddled mothers blog. I too am a muddled mother of 4--16 yr. daughter, 14 year son, 7 year daughter, and 2 1/2 year son (had him at 38). Two seperate marriages, 2 each marriage. Just read this article and congrats on your new addition. I beleive there is a reason for everything..for whatever reason you had your beautifu daughter, she was meant to be! I did not plan to have more children after my first marriage, but God said yes so here i am 4 children at the age of 41. I wouldn't have it any other way. Yes, i've extended my motherhood obligation another 18 years..I embrace that and thank god everyday for it. Sometimes I wonder what it will be like when all my children are gone..I anticipate that after all these years of being a mom...muddled most of the time...that I will certianly miss it. 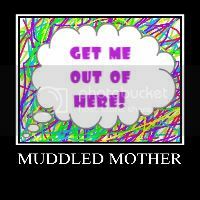 I suppose if our lives were not muddled as mothers we wouldn't be doing it right! keep up the good work..you are an excellent writer. Thanks for you comments. They were very thought provoking. Please join the blog by clicking on the "follower" button on the right hand side of the page. That way you'll be notified when new text is posted. I am glad you like it!